Band at Cliff house, SF, CA. Campbell's Jazz Soup (www.campbellsjazz.com) plays a fun blend of 1920s, 30s, 40s, and 50s jazz and swing at events, parties, festivals, and weddings throughout the San Francisco Bay Area and beyond. We play everything from mellow background jazz to upbeat danceable swing with some light Latin thrown in. Brian arrived early, and was courteous and talented. We asked for jazzy sax as the CEO is a big fan, and Brian did an excellent job for us. We (the Google Cloud Rocky Mountain team) hired Campbell's Jazz Soup for a corporate wine and jazz event in downtown San Francisco attended by our customers. In short, they were fantastic. The band was professional, on time, and looked great. Brian was always responsive, totally flexible, and easy to work with. Musically, these guys are extremely talented. They can cater to specific styles or subgenres, and can also just mix it up and run with it - reading the crowd as they go. Highly recommended!! Brian's three piece band played for my 60th birthday party over the Labor Day weekend. They were on time, did a great job and definitely brought the party up several notches. I would highly recommend them to anyone who wants to make any gathering better. Super flexible and sounds great! We hired Brian and Campbell's Jazz Soup to play at our wedding this August. Brian was super responsive and easy to communicate with via phone and email, and he was willing to work with every request we made (instrumentation, song list, playing with/without amplification, moving locations during the evening, playing louder/softer, etc). And, they sounded spectacular! They gave the event the exact feel that we were looking for. Couldn't be happier that we hired them! These guys crushed their Dixieland set! Brian and his crew of band members were exactly what we were hoping for. We wanted fun, upbeat Dixieland music being played while people had dinner outside, and they rocked it. They were plenty loud, even with no amplification, and Brian was very responsive over email and phone. Would definitely hire them again! Campbell's Jazz Soup helped to create the perfect atmosphere for our backyard wedding reception. The musicianship was top-notch, the band was able to accommodate every musical request we made, and the energy of the group was fantastic. I play the trombone, and they were even gracious enough to let me sit in with them for a tune - planning the details well in advance to help me avoid embarrassing myself, then being incredibly supportive in the moment. Beyond the event itself, Brian Campbell was a dream to work with. He communicated clearly and professionally about details of the performance throughout the planning process, from cost to space to audio set-up to timeline. In what often felt like an overwhelming process of wedding preparation, all of our work with Brian was seamless. I can't recommend Campbell's Jazz Soup highly enough, both for the quality of their performance and for the ease of setting it all up. Great embodiment of Nawlin's style jazz! Brian was on time, professional, and did an amazing job with bringing Nawlin's style jazz to a Fat Tuesday party I hosted. Brian even recruited a friend from his pool of musician friends to join him so I didn't have to independently source another musician to work alongside him. Our company hired Campbell's Jazz Soup to play our Speakeasy-themed holiday party this year and they were a perfect accompaniment to the venue and theme. Their music was an absolutely spot-on selection for our event, everyone loved the music and kept asking me how we found them. Our CEO said it was the best holiday party our company has ever hosted. Brian was professional, quick with communication and great to work with. I would definitely hire them again and would recommend them to anyone looking for old-school jazz to liven up their event. I'd give them more than 5-stars if I could! Campbell's Jazz Soup played at one of our many community events and they DID NOT disappoint, they made our event better than it could have been. Previous to the date of the event, Brian was very professional and coordinated with me in a timely manner, and answered all my questions. Day of event: The band arrived on time and set-up hassle free. They had all the necessary equipment, interacted with the crowd, cracked jokes and was just very nice. Our guest were very impressed, all the songs they played flowed well, Brian on the vocals was definitely a crowd pleaser. Really Looking forward to our next event together in the future! Brian and the rest of the crew were a HIT! They were a perfect addition to our company's Mardi Gras-themed party and are so talented. The guests continued to rave about them after the event. As an Event Planner, I really appreciated Brian's attentiveness and response time in regards to planning the event logistics. Thank you! Whether for dance or listening you cannot go wrong with Campbell's Jazz Soup for any occasion. These guys made our 50th Anniversary Party a resounding success. I hired this band to play for my husband's 50th surprise birthday party. I threw the kink in things by not giving them a standard venue, but asking them to play on a yacht. Brian was super accommodating and spent lots of time hammering out the details. We had Campbell's Jazz Soup for a life celebration event and the band was awesome. Everyone at the event raved at the quality of the music and one of our guests joined the band to lend vocals for "Summertime". I hired Campbell's Jazz Soup for a 20's-themed holiday party. They were extremely thorough, prompt, and professional throughout the entire process. They read the energy in the room perfectly, and played exactly the right kind of of off-the-hook swinging 20's style jazz that got everyone in the room moving and dancing. The party guests were raving about them afterwords. I highly recommend Campbell's Jazz Soup. Fantastic group for our nonprofit fundraiser! I booked them for my nonprofit's major donor fundraising event and they couldn't have been a better choice!! They were happy to accommodate all of our requests - including playing louder during the cocktail hour and nice and soft during dinner. Our guests loved the style and quality of the music - velvety and classic with a great balance of mellow & upbeat. We went with the three-piece band which was just the right size for us - we had a room of about 100 guests. The band leader, Brian, was also a pleasure to work with. He was friendly, communicative, and always prompt to reply to any questions I had. This is a fantastic band and I would readily recommend them to anyone looking for that 20s, 30s, 40s & 50s jazz & swing sound!! Fabulous musicians.....helped create a "Joyful" Funeral!! What an amazing group of musicians!!! I would recommend them for any event....such beautiful music. They marched my 90 year old Auntie to her final resting place to the wonderful sounds of Dixie Land Jazz.....they picked the perfect songs and made a very sad event into a joyous celebration of life. More than one person came up to me and said they have never been to a happier funeral and another said their music helped lift the weight from their heart....and my Auntie ....she was up there in heaven kicking up her heels and singing along. PLEASE consider this if you are planning a loved ones funeral.....it truly will make it a celebration of life!! We hired Campbell's Jazz Soup to play at our wedding and reception a couple of weeks ago. They were fantastic! From the beginning, Brian worked with us to plan the music (they have a huge repertoire), which set the tone for the whole afternoon. They provided lovely music for our ceremony and then got everybody dancing with lively upbeat jazz standards. We are still getting heartfelt compliments about the band from our guests! Also, when a friend of ours unexpectedly serenaded us with "Let's Get It On", they backed him up and totally nailed it! They really helped make our wedding and reception special. Thanks, guys! Campbell's Jazz Soup was the perfect band for my recent wedding. They are very easy to work with and are easy to contact. They answer promptly and are very organized. The music was exceptional and everyone was pleased at my wedding and kept telling my husband and I how much they enjoyed the music. I am so glad I went with them! I highly recommend. Both before and after we decided to have them for our wedding, Brian was so nice and patient even we ended up giving him the decision very last minutes. Speaking of their performance, We loved it over all. They had so many songs and we could pick them as many as we wanted! Also, they adjusted the outfit based on our requests which was to wear hats and no black color clothing. Lastly, I loved their music note bow-ties! Again, Thank you so much for an amazing performance for our wedding!! Our nonprofit agency was hosting the annual fundraising event, with a Casablanca theme up at Sequoyah Country Club in the Oakland hills. The band was fantastic! We needed a 1940s wartime theme-based band; the setting was a Moroccan evening inside and out. They were outside during our after dinner dessert/coffee hour. Amazing - everyone commented on how much fun they were and the music both fit in as background as well as fun for some dancing. Great sound created perfect atmosphere! This band created the perfect atmosphere at my event! The crowd loved them, their song selections were perfectly curated, and their sound levels were consistent and perfect for the space. They were an extremely professional group, and I would hire them again in a second! Just wanted to share this event with anybody who may be looking for a fantastic band to entertain your guest for a similar event, if your planning one. Campbell's Soup Jazz is a perfect band for all events. I planned a small surprise birthday party for my wife. Well, the kids had the wonderful idea that they wanted to throw their mom a surprise birthday party. Mom are very difficult to surprise because they're involved in any happenings around the house, so planning was extremely difficult. Brain made it quick easy and simple to book some entertainment for this event. I was short on time and wanted to put together the perfect event for a most deserving mother on her 50th Birthday. The party had a 1940's theme that took place in a small speakeasy restaurant setting. Brian's Campbell's Soup Jazz was able to provide a duo small enough to accommodate the party venue. They provided great sounds for this small intimate party, all guest were not only impressed with the party the kid and I threw guest raved about the music. She was definitely surprised. I would recommend Campbell's Soup Jazz for anyone in search of good professional musicians. I really want to host a larger event that I could have the rest of the band play. I know it will be swinging! Campbell's Jazz Soup provided the music for our vintage-inspired wedding reception. A trio played for cocktail hour and then we kicked it up to the sextet for post-dinner revelry. We couldn't have been more pleased - what an amazing band! The music was easy to dance to for someone of any age (even the little guys grabbed a partner and were swinging!) And for those who preferred to be spectators and talk, watch and listen, it was perfect too. All of our guests absolutely loved it, and it really set the tone for our event, bringing it all together and creating exactly the atmosphere we were seeking. From a logistical standpoint, Brian was responsive, professional and reliable from our first contact. Book Campbell's Jazz Soup, you won't be sorry! I was charged with the fun part of my in-laws 70th wedding anniversary. As the son, I had to make it perfect. The music list, the tempo and integration into the party, the fact that the entire family was from India – the bar was high. Brian was great to work with from the moment go. Flexible but profession contract management. Expert instrumentation and selection of band members based on song selections and occasion. Then the best value for the price as he worked to help me manage my cost constraints. I think this is every bookings checklist, but from the moment we first starting chatting, I knew he was hands-down, the right choice. We had a mostly instrumental swing and jazz standards set list, with only a handful of vocals, and largely unplugged. Sublime, perfect ambiance, and a 100 comments from the party-goers that we did it right. Thanks so much Brian and the whole band for making this the best event ever, and cementing my place in the son-in-law hall of fame. Campbell's Jazz Soup was an amazing addition to our wedding. They were super accommodating with our schedules and even dressed in 1920's attire to fit our theme. 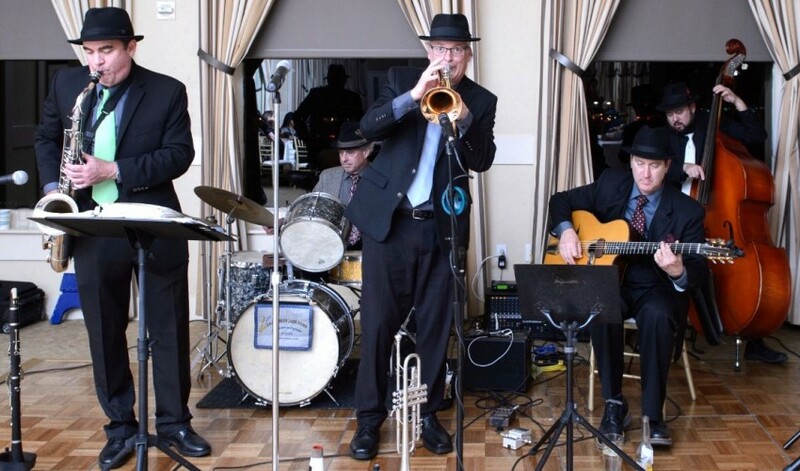 From the light dinner music to the upbeat Charleston, this band is definitely a must have for your next event. Campbell's Jazz Soup is MM MM Good! I booked Campbell's Jazz Soup for a surprise 70th birthday party at West Wind Winery on June 29, 2014. Brian and the band did an excellent job entertaining the guests with a fun blend of classic jazz, dixieland and contemporary favorites. So many people during the party were raving about them. The band is high on my list to book again for a future event. I went with a 4 piece band(sax/clarinet, piano, stand-up bass, guitar). It was perfect! I would easily have added a trumpet player but the guest of honor isn't a big trumpet fan. When you book them I highly recommend you go with a 4 or 5 piece band. These guys are super talented and a great addition to any party. Thanks again Brain for stretching out "Unforgettable" to a seven minute song until the guest of honor made his way to the winery. Campbell's Jazz Soup was a perfect band for our holiday party. We chose the 5 person configuration and were very pleased with everything. The band was also flexible enough to accept bitcoin which I very much appreciated. Highly recommended. Yes, we now accept payment in bitcoin! Contact us for more details. Hired Brian Campbell and his colleague Bill to play as a duo at our Holiday Party and they were terrific. I say perfect hire as the price was very fair, much more than many other groups I contacted, they dressed professionally and arrived with plenty time to set up ahead of the event and they were both great musicians. They played typical holiday songs along with some jazz classics. 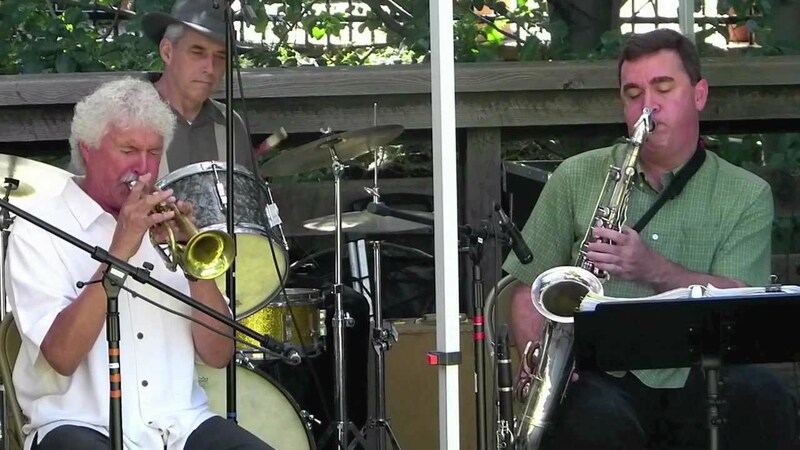 I was worried about only having a duo with our tight budget but it worked great with Bill on guitar and Brian playing sax, clarinet, and singing. I would hire these guys again in a heartbeat, and I suggest you do the same. If you have a larger budget I say go with their trio or quartet. They will not disappoint. We loved working with Brian and his band for a party at our house. Brian is extremely professional, responsive and considerate. The band's musicians are excellent and they play an incredible array of jazz tunes across all eras. I would love to have them again and would recommend them in a heartbeat! According to your wishes and budget the band can perform with up to seven musicians. Our core trio is composed of leader Brian Campbell on clarinet, saxophone, and vocals accompanied by guitar and string bass. Trumpet or drums are added to the trio for our four musician band; trumpet and piano or drums are added to the trio for our five musician band; trumpet, piano, and drums are added to the trio for our six musician band; and trumpet, piano, drums, and trombone are added to the trio for our seven musician band. If you want to dance we suggest going with at least five musicians. And if you're interested in Dixieland in the New Orleans tradition with banjo and tuba, we can do that too (our last three audio samples demonstrate our Dixieland sound). For close to two decades we've played many events throughout the San Francisco Bay Area and beyond including weddings, festivals, parties, and corporate functions. Please contact our leader, Brian Campbell, for availability and rate info. You can contact him and get additional info about the band on our website at www.campbellsjazz.com. Thanks for visiting and we hope to hear from you soon! Here are some commonly asked questions and their answers about our services. Does your rate include the time it takes for the band to set up and tear down? Yes. So, for example, if you hire us to play from 8 pm to 11 pm, we would arrive about 45 minutes to an hour before 8 to set up, play from 8 to 11, and then tear down after 11. When do you typically arrive at the venue? We typically arrive at the venue about 45 minutes to an hour before we start playing. This allows us plenty of time to load in, set up, warm up, and tune. If you wish for us to be set up before our playing start time, we charge for that time at our normal hourly rate. For example, if our playing start time is 8 but you want us to be set up by 7, we would charge for the hour from 7 to 8 even though we're not playing during that time. So, essentially we charge for the time we are required to be set up at the venue whether we are playing or not. Yes, we require a ten minute break for every hour we play. Our breaks can be moved around and combined in some cases to accommodate your schedule. The band leader is willing to do some light MCing like announce the first dance or introduce the birthday honoree. Does your band have a vocalist? Yes, the band leader is the main vocalist in the band and you can hear his vocals on some of the demos. You can have as many or as few tunes with vocals as you wish or none at all. If you're interested in a dedicated female vocalist, we do work with several. Please contact us for more info. Can I choose the songs you play at my event? Yes, from our repertoire list you may choose as many of the songs that we play at your event. If you have a special song you want us to play which is not on our repertoire list we might be able to do so if the song is a jazz or swing standard. At a wedding, are you willing to play for the ceremony? Can you play classical music for the ceremony? No, we would play in our usual jazz and swing style but you would be welcome to choose the ceremony song from our repertoire list. Or it may be possible for us to play your requested jazz or swing standard that's not on our list. Can we use your microphone for announcements and/or toasts? Is it wireless? Yes, you are more than welcome to use our microphone. We can usually get the use of a wireless microphone, but it depends on the event and instrumentation. Please contact us for more info. Do you require that we provide you with a meal? If we’re playing three or more hours or we traveled an hour or more to your event, yes, we do require a meal. It does not have to be fancy so a good quality "vendor meal" is fine. That's up to you, within reason. We’ll dress from casual on up to jacket and tie. Each musician usually arrives in their own car. The reason we typically do not carpool is it's impractical as we live in different areas of the SF Bay Area and we all are carrying a certain amount of equipment which limits the room in our cars. We prefer free parking close to the venue but we know this is not always the case, like in downtown San Francisco. So, in situations where parking is limited we appreciate any help we can get, like being offered monetary compensation for parking in a paid lot, getting the use of a loading zone, etc. Because of the amount of our equipment and some of its delicate nature, we cannot be shuttled to the venue. Also, because of some bad experiences we've had in the past, we prefer that our cars not be parked by a valet service. What are your space and other requirements for the bandstand? For the trio we prefer to have an area of at least 8’ by 10’. With additional musicians we obviously need a larger area, especially if there's a drummer. The six musician band with drums and piano is comfortable in a space of about 12’ by 16’. We do not require a stage so we are perfectly fine playing on the floor. But we do require we're not located in any place where people would need to walk through the band to access something like a walkway, a doorway, a closet, a table, etc. So a good location for us is against a wall or some other barrier. If we're located outside, we require we're on a solid level surface like concrete, pavers, decking, etc. We essentially cannot play on loose dirt, gravel, or grass unless you set up a stage for us or put down plywood for us to play on. Finally, if we're located outside, we require we're in shade at least 80% of the time. Not only is this for our own comfort but for the benefit of the instruments and amps which can overheat and/or go out of tune in direct sunlight. Do you play through a public address (PA) system? It depends on the number of guests at the event, the size of the venue, and whether the venue is outside or not. Some of the venues we play are small enough that we don't need to use a PA as we are loud enough with our set up of horns (sax/clarinet and trumpet) and drums which are not amplified and acoustic guitar, piano, bass, and vocals which are amplified with small amplifiers. If there are many guests (like 50 or more), the venue is quite large (like the size of a basketball court or larger), and/or the event is outside, then the use of a PA is likely needed. With most events we assume a PA is needed and, therefore, the cost for us to transport it, load it in, set it up, and monitor it is typically included in our price. If the event is small and a PA is not needed then we may be able to play without one in which case we would be able to reduce our price a bit. Please contact us for more details. Yes, if you want recorded music played through our sound equipment during our breaks we can play classic jazz and swing from our own player or we'll gladly play tunes from your player. No, we do not. We are fine using the typical lighting at the venue. So, we ask that we're not located in any area that is darker than what the typical guest will experience. We require an electrical outlet near where the band sets up and, depending on the event, possibly an armless chair for each musician. Folding chairs are fine. When you return the signed contract we require a deposit of half our total fee by cash, check (made out in the leader's name, Brian Campbell), or a fund transfer service like Paypal or Venmo. We require the full remaining balance by cash, check, or fund transfer on the day of the event. We can take credit cards but there's a 3.1% fee for that service. Is there a fee if we cancel? Yes, your deposit is the cancellation fee. So, if you cancel our services after giving us the signed contract and deposit, we keep the deposit. Here is a partial list of tunes we play. To get our full list please contact us. All the great jazz and swing artists including Fats Waller, Ella Fitzgerald, Benny Goodman, Duke Ellington, Count Basie, Django Reinhardt, Frank Sinatra, Lester Young, Stan Getz, The Dorsey Brothers, Zoot Sims, etc.